elements but allow the health boosting minerals and nutrients to still be present in our water. any other filter on the market and the water taste is unsurpassed. -Up to 500% lower discharge and waste water than typical Reverse Osmosis systems! -Reduction/ Removal virus’, bacteria, VOC’s, and Pesticides. -Reduction of the salt content (brackish water). -pH of the water can be altered for better health. -Ideal for municipal water supply, well water, river and rain water. -Removes Iron, Lime and other problem causing chemicals often neglected by water softeners. -Can be used in times of disaster and water never needs to be boiled! 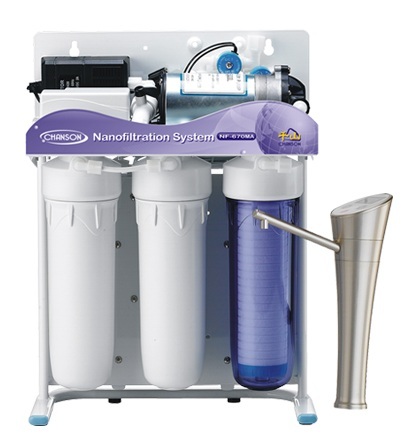 -Nano prefilters can be customized to address your specific water issues.